I take absolutely no credit for the photos in today's update, the only thing i did was pull them down and resize them to fit my little scroller. I resisted the temptation to tweak or modify colors or sharpness in anyway, because, you know, i did not make the pictures, so how can i say how they were supposed to look? Plus, you know, it's not polite to take someone else's pictures from their site, and then JAM THE CURVES. Anyway, I found them on the blog of supertouch, but as it is a show i really wanted to get out to, and i figure a lot of you are probably like me, this is the closest a lot of us are going to get to a show that's now just a page in history. 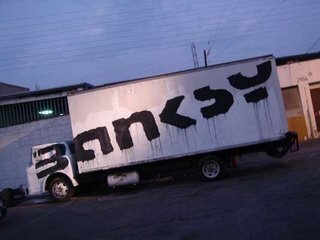 For those of you who didn't know, Banksy launched a "secret" show in Los Angeles over the weekend, and today's images are photos from that show. Enjoy, and also, at the end of the scroll, you can click on the supertouch logo and be transported directly to the supertouch blog. dTown | 12:55am | 69˚ and pleasant.